While a flower-growing simulator may not be everyone's cup of tea when it comes to mobile gaming, Game Insight's Flower House has a surprising amount of content. 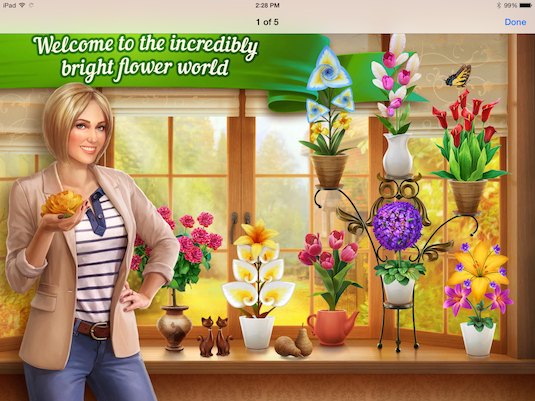 You can not only plant, grow and showcase a fine assortment of flowers, but also crossbreed into new types and interact with unique characters that share your love for all things flowery. That said, these tips will turn you into a gardening machine. How do I plant flowers in Flower House? The game walks you through the process when you first begin. You'll pick what kind of seed you want to use for your flower first, choosing from different levels. Some can't be accessed until you level up, but you'll get there. Next, you'll need to water your plant. This requires using water from a meter measured at the top of the screen. You have a certain number of waterings you can use before you either have to wait for it to refill or use a gem to fill up automatically. The plant will then grow, which can either take a couple of minutes or grow automatically by contributing a gem. Once grown, you'll be able to collect stars that will help increase your leveling, and open up potential new slots for other flowers. From there, you can either bloom your flower to grow bigger (which requires more watering) or cut it. By cutting it, you can move it over to the crossbreed section (more on that in a second) and collect the gem that emerges from underneath. Continue this process, and you'll be able to get a championship garden in no time. How do I crossbreed flowers in Flower House? The game features a laboratory that you can visit by swiping towards the right on the main screen. From here, tap the open container and you can see what flowers are available for crossbreeding. You'll need to wait to get enough flowers in your inventory from growing before you do this. Once you successfully crossbreed a flower - which is simply a matter of selecting which two you want to combine - you can add them to your collection and clean up even more coins and gems as a reward. You'll also be able to show them off to your fellow neighbors once you get to level 5. How do I keep track of my assignments in Flower House? Assignments are displayed on the left side of the screen, and usually range from opening up new flowerpots to crossbreeding special plants to catching butterflies simply by tapping them. Doing so will reward you with more coins and gems, which you can use to purchase item. What can I buy in Flower House? By visiting the shop, you can select from a number of items to help your flower collection prosper, including flower pots, special new kinds of seeds, nectar (for growth purposes), flower stands and more. Shop around and see what works best for your collection. How can I see what flowers I have available in Flower House? Simply click on the Inventory button. This will show you everything you have in your arsenal, including flowers and seeds. It's important to keep track of this and add new items from the store if you want your flower collection to pick up. Do I need to pay for anything in Flower House? The game is mainly free-to-play, and provides a decent amount of coins and gems to purchase items, but additional currency is available for purchase if you want to go for the premium goods. Coins and gems can be purchased in amounts ranging from $1.99 to $99.99. We suggest seeing how far you get with the game first before making purchases.